Auger Cast-In-Place (ACIP) piles are specialized deep foundation system that are installed by rotating a continuous flight hollow-stem auger into the ground to the desired depth or until refusal is reached. Once at that refusal or termination depth, the auger is slowly extracted as the grout mix is continuously pumped into the augered hole. 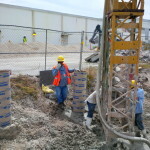 The pile shaft is then formed as a continuous flow of grout replaces the soil that is being removed. After the grout, has been poured, the steel reinforcement is carefully installed by lowering the steel to the required depth. Load tests are performed to determine and confirm the bearing capacity of the pile that is to support the proposed structure. 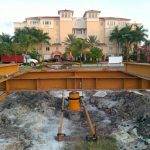 The load test measures the bearing capacity by applying gradual force downward, upward and / or sideways; measuring the compression, tension and lateral resistance of the piles. 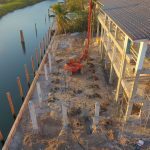 This is performed with a hydraulic jack in which is attached to a framed structure that is fixed to the anchored piles (also known as reaction piles). Underpinning is the process of strengthening or supporting the foundation of an existing building or structure. 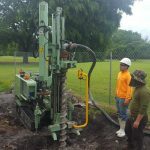 This method is used to upsurge the foundation depth or repairing a defective foundation by using micro-piles, pin piles or helical piles. 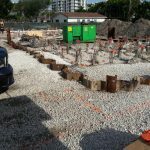 Micro-piles are another type of deep foundation system that are constructed using high-strength concrete grout, small diameter steel casing and/or threaded bars. 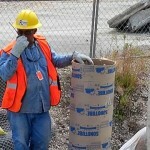 These piles are normally ideal when working in difficult access areas and/or inside a structure. 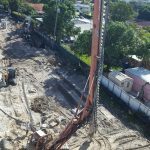 Pin piles are steel piles with small diameters that are used for structural prevention of any settlement that can arise from compressible or weak soil. This foundation method helps to stabilize soil and underpinning footings. 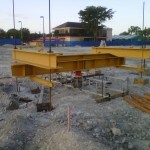 They are ideal for those structures with physical and geotechnical restraints. Helical piles are another type of underpinning foundation in which is built by using steel shafts with a series of circular steel helical plates welded at specific positions along the shaft. They are innovated piles that are twisted into the soil to bear the depth required while monitoring the torque to estimate the capacity of the pile. 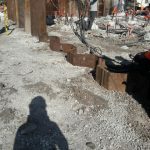 Sheet piles are sections of vertical interlocking system that creates a continuous wall used to retain either water or soil from coming within the project limits. These sheets can be installed permanently or for temporary usage. Drilled Shafts (also known as Caissons) are high capacity cast-in-place piles. An auger opens the soil to the diameter of the planned shaft and is drilled to reach the desired or refusal depth. Normally, the casings (sono-tubes) are used to maintain the hole open. 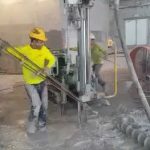 The reinforcing cages are carefully installed by lowering the cage to reach hole depth and the hole is then filled with concrete grout, of a specified strength and consistency.